Provide comfort for the family of Paul Daniel Ohrman with a meaningful gesture of sympathy. 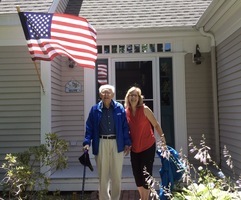 Boxborough, MA: Paul Daniel Ohrman, a retired metallurgical engineer and published author of “Living to Serve: Church, Family, Country” and “Bridges to Peace. WW II Through the Lens of a Combat Engineer” died peacefully with his family by his side at home March 9, 2019. He was 96. He was a dedicated and active member of his community as an Eagle Scout, Board of Regents member at Trinity International University in Deerfield, IL, the Christian Businessmen Board, Youth for Christ treasurer and Board of Directors member, and attended the First Evangelical Free Church of McKeesport for many years serving as Chairman, Elder, teacher and Missions Committee Chairman. He also served the Allegheny District of the Evangelical Free Church of America in various capacities, including chairman. In 2014 Mr. Ohrman moved to Boxborough to reside with his daughter, Kristine Young and her family. He became a beloved member of the community and attended the Faith Evangelical Free Church in Acton, MA. He is survived by two children: Timothy and Susan (Whitfield) Ohrman of Marlton, NJ; a daughter Kristine (Ohrman) and Michael Young of Boxborough, MA; 4 grandchildren Rebecca (Ohrman) and Matthew Wieber of Gilbertsville, PA, Erik Ohrman of NYC, NY; K. Michelle (Young) and Dar Heinze of Chelmsford, MA; and Stephen and Emily (Purinton) Young of Ft. Campbell, KY; and 9 great-grandchildren. He was predeceased by his beloved wife, Alice (Roland), and his brother, Clyde Ohrman of Estero, FL. To his family he was a hero, not just because of his service in WW II, but because of his life of integrity for the glory of God, showing us all how to live out our faith. A memorial service will be held March 30th at 1:00 p.m. at the Faith Evangelical Free Church, 54 Hosmer St. Acton. Burial will be in Versailles Cemetery, McKeesport at a later date. In lieu of flowers, memorial gifts may be made to the EFCA Crisis Response 3928-1, Evangelical Free Church of America, 901 East 78th St., Minneapolis, MN 55430, online at https://www.efca.org/give. Financial gifts go to supporting natural disaster victims around the world. Please designate gifts either by mail or online to EFCA Crisis Response 3928-1 in memory of Paul D. Ohrman. In lieu of flowers, memorial gifts may be made to the EFCA Crisis Response 3928-1, Evangelical Free Church of America, 901 East 78th St., Minneapolis, MN 55430, online at https://www.efca.org/give. Financial gifts go to supporting natural disaster victims around the world. Please designate gifts either by mail or online to EFCA Crisis Response 3928-1 in memory of Paul D. Ohrman. Burial will be in Versailles Cemetery, McKeesport at a later date. We encourage you to share your most beloved memories of Paul Daniel here, so that the family and other loved ones can always see it. You can upload cherished photographs, or share your favorite stories, and can even comment on those shared by others.